Issue 5 of Alt Hist , the magazine of historical fiction and alternative history, is now out. This edition features stories about Al Capone and Italian Futurism, the aftermath of the American Civil War, the real Frankenstein, the Bridge that consumes the souls of men, and the latest instalment in a series of stories about a successful Nazi invasion of Britain. Neil Gaiman’s Commencement Address to the graduating class of the University of Arts in Philadelphia (May 2012). I listen to this when I need encouragement and inspiration. 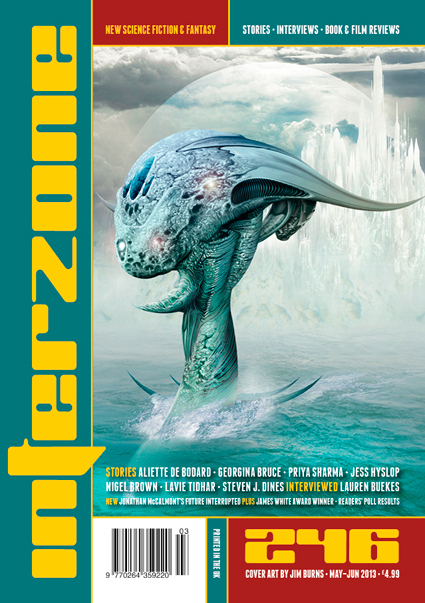 The May–June issue of Interzone is now out and contains new fiction by Steven J. Dines, Jess Hyslop, Nigel Brown, Aliette de Bodard, Lavie Tidhar, Georgina Bruce, and James White Award winner Shannon Fay. I’m also very happy that it contains my story “Thesea and Astaurius”. The cover art is by Jim Burns, and interior colour illustrations are by Richard Wagner, Martin Hanford, David Gentry, Vincent Sammy, and Wayne Haag. All the usual features are present: Ansible Link by David Langford (news and obits); Mutant Popcorn by Nick Lowe (film reviews); Laser Fodder by Tony Lee (DVD/Blu-ray reviews); book reviews including an interview with Lauren Beukes conducted by Maureen Kincaid Speller, and the first of Jonathan McCalmont’s new column Future Interrupted. It looks like it going to be a great issue with the likes of Lavie Tidhar and Aliette de Bodard, but I’ve also got my eye on the Steven J. Dines and Georgina Bruce stories. I’m a big fan of Georgina Bruce’s work and am glad to see her in Interzone. 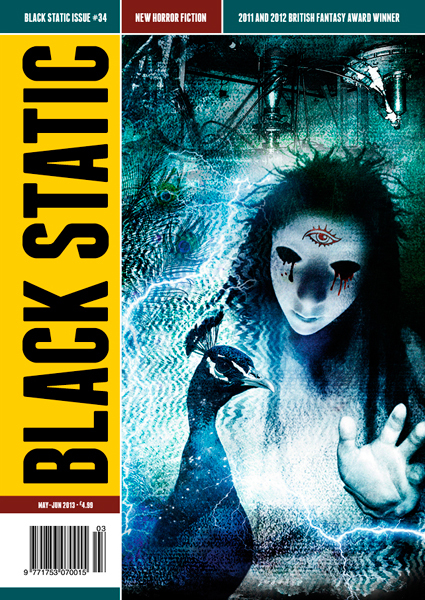 The May–June issue of Black Static is alsoout and contains new fiction by Nina Allan, Joel Lane, Andrew Hook, Sean Logan and I’m pleased to see a story by Ilan Lerman in there after his debut in Black Static 32. The front and back cover art is by Ben Baldwin, and interior illustrations are by Ben again, Martin Hanford, Tara Bush, Joachim Luetke, and Richard Wagner. Comment by Stephen Volk and Lynda E. Rucker; TV reviews by Mike O’Driscoll; DVD/Blu-ray reviews by Tony Lee; book reviews by Peter Tennant, including an in-depth interview with Mark Morris. Yes, I know I’ve gone a little crackers here but the artwork for these issues is awesome – if you don’t know either of the magazines go and get yourself a copy now!